Industrial Magnetics, Inc. has designed a new, SimpleClean™ magnetic drawer-in- housing that’s substantially easier to clean than the traditional "manual clean" models on the market. A drawer-in-housing, or drawer magnet, typically consists of rows of staggered magnetic tubes which force the product to be purified to cascade over the tubes and removes any foreign tramp metal from the product. Collected metal must then be removed from the magnetic tubes on a regular basis to prevent "wash- off" back into the product stream. To accomplish this, a user removes the row of tubes from the housing and has to pick off the collected metal by hand - which can be difficult and time-consuming, as the entire tube is magnetized. IMI’s new design, the SimpleClean™, alleviates this problem by incorporating a non-magnetic "dead-zone" at the end of the magnetic tubes, which sits well outside the product flow during operation and does not interfere with metal capture rates. This offers a distinct advantage; during cleaning, it allows the operator to take a gloved hand or shop rag and wipe any collected metal down to the dead-zone where it simply falls off as it becomes free of the magnetic field. The SimpleClean™ housing is available in 2 or 3 row configurations with standard inlet/outlet lengths and widths from 6"-24" in 2" increments. Custom designed housings (round or rectangular) with custom transitions, food grade finishes and wear resistant coatings are also available. 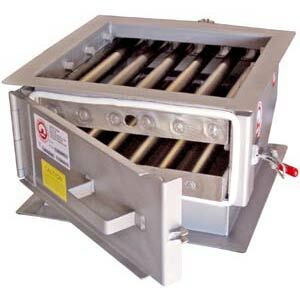 For a video demonstration of the SimpleClean™ Magnetic Drawer-in-Housing, please visit their website at www.magnetics.co m/media_videos.asp and select "Tramp Metal Group" videos from the Product Group Selection dropdown menu, or contact our Tramp Metal Group at 888.582.0821.